Ring Hill is the 820th highest place in Ireland. 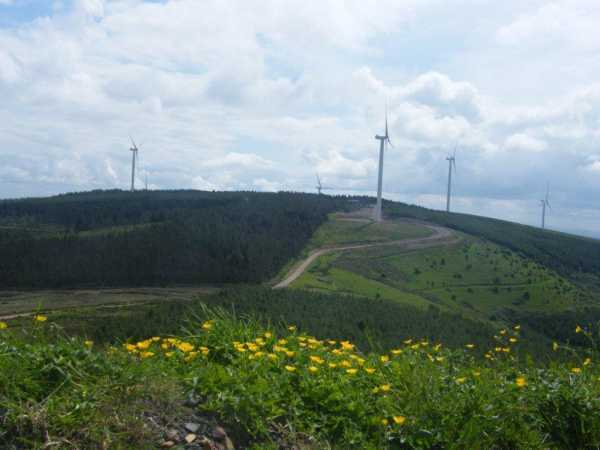 Picture from group : Ring Hill from Glenaneagh showing wind farm tracks and works! Picture: Ring Hill from Glenaneagh showing wind farm tracks and works! Welcome to Glenough Wind Farm! Park at a small field entrance at R94525 53427 A (Point A) on the narrow roadside where there was room for only one car.Walk back up the road towards Hollyford and cross the first gate to your right. Cross a tree lined ditch and then gently uphill to the summit area of Glenaneagh and its windmill. Head downhill to the south east from here to the field corner on the left, cross the fence to a rough, muddy track end. Follow the edge of the forest uphill still going south east. When you reach the field corner the summit is just up the forest track to your left.